Since Italy’s monetary unification some 155 years ago, income per capita in the South (the Mezzogiorno) has fallen from virtually the same level as in the Centre-North to little more than 55% of the Centre-North’s level. This column asks why East Germany hasn’t suffered the same fate since German monetary unification 25 years ago. East Germany is not like the Mezzogiorno because of labour market flexibility, different evolutions of the tradeable sector, and the weight of history. Should we believe the German labour-market miracle? Italy’s monetary unification took place some 155 years ago. At the time, income per capita in Southern Italy (or the Mezzogiorno, as it is often known in Italian) was, according to the latest estimates, virtually the same as in the Centre-North of the country (SVIMEZ 2011). Today it stands at little more than 55% of the Centre-North’s level (Figure 1). German monetary reunification took place 25 years ago. At the time, income per capita in East Germany was less than 40% of that in West Germany. Today it stands at roughly two-thirds of the level in the West of the country (Figure 1). 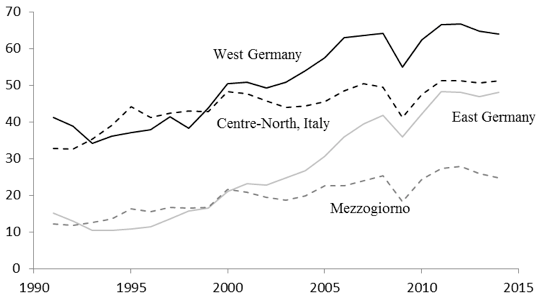 Econometric estimates confirm that, since the war, Italy has seen divergence in its regional per capita incomes, while East Germany, since the fall of the Wall, has witnessed convergence. Sources: Statistische Ämter des Bundes und der Länder, Volkswirtschaftliche Gesamtrechnung der Länder; ISTAT, Conti e aggregati economici territoriali. At the time of reunification, a popular view was that the former GDR was going to become a German Mezzogiorno. In an earlier paper, we had already argued against that hypothesis (Boltho et al. 1997). In a recent paper, we revisit the issue some 20 years later and provide evidence that three major differences between the poor areas of the two countries – labour market flexibility, different evolutions of the tradeable sector and the weight of history – lie behind these stark differences in regional development (Boltho et al. 2016). Wage equalisation in a monetary union in which some regions have lower productivity levels than others is highly likely to lead to divergent economic outcomes. Full wage equalisation across the whole country has not been fully achieved either in Italy (despite the abolition in 1969 of legally differentiated wages across regions), or in Germany (despite the promises made at the time of unification), but Southern Italy’s already low industrial productivity levels fell further relative to the Centre-North over the last 20 years, while they rose very rapidly in East Germany, reaching virtual parity already by 2004. From being hopelessly uncompetitive at the time of unification, East German unit labour costs are now on par with those of West Germany thanks, at least in part, to trade union flexibility and wage moderation. The same clearly did not happen in Southern Italy, a region whose relative competitiveness has remained low throughout the post-war period. Sources: Statistiches Bundesamt, Aussenhandel, Jahresdaten ab 1970; ISTAT, Commercio estero, serie storiche. Even employment in the tradeable sector, which has been falling virtually everywhere in Europe over the last two decades, has shown some recovery in East Germany to levels close to those of West Germany, and among the highest in Western Europe. That tradeables are crucial for economic performance is confirmed by econometric investigations which, by eliminating the possibility of reverse causality, show that the higher is the share of tradeables in output, the higher is per capita income in both German and Italian regions, in line with previous research on this issue (Buch and Toubal 2009, Buch and Monti 2010). More interestingly, panel data estimations show that for East German regions, but not for the Mezzogiorno, rising trade played an important role in driving rising per capita incomes. Clearly, one of the major reasons for the Mezzogiorno's lag on both East Germany and the Centre-North of Italy has been the sluggish development of its tradeable sector. 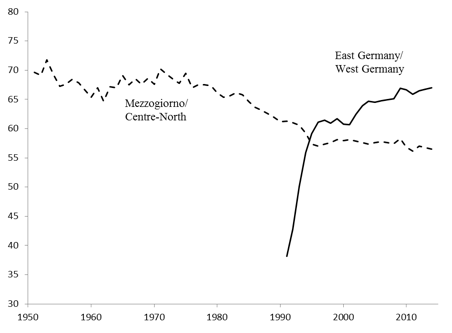 Why East German foreign trade has been a relatively dynamic component of demand in contrast to trends in Southern Italy, might, at least in part, be due to the commodity composition of the two regions’ trade. Using an approach pioneered by Hausmann et al. (2013), an attempt was made to estimate the ‘complexity’ of the two regions’ export bundles, where complex products are those that require numerous and diverse capabilities. Research has shown that such products are a very good indicator of future growth prospects (Hausmann et al. 2007). Not surprisingly perhaps, it turns out that the East German export bundle has a much higher ‘complexity’ index than that of Southern Italy (Figure 3). Sources: See Boltho et al. (2016). This is where history comes into play. What is today East Germany was in the past among the more developed parts of the country (and of Europe), in contrast to the Mezzogiorno’s relative backwardness. Germany’s industrial revolution in the 19th century began in Saxony (in East Germany). By contrast, Italy’s 1861 unification led to a gradual process of de-industrialisation in the South of the country. But the differences go further back in time. The relative lack of trust and social capital that characterises Southern Italy today, in contrast to the Centre-North, and that many consider one important reason for the region’s backwardness, may well be due to the prevalence over several centuries of absolutist regimes in the Mezzogiorno, as against the existence of relatively free city states in Central-Northern Italy (Guiso et al. 2008). No comparable studies exist for Germany, largely because there were no such early stark cultural divisions across the country. So-called ‘free and imperial’ cities existed in both areas, the Hanseatic League was active in West and East alike, universities flourished from the later Middle Ages across the whole of Germany, and so on. Trust and social capital could have been destroyed, however, by the 40-plus years of Communism. There is, indeed, survey evidence showing that East Germans still today display higher levels of social distrust than do their Western compatriots. Yet, harder evidence, surprisingly perhaps, paints a much less unfavourable picture. Thus, the incidence of voluntary work, for instance, or the presence of non-profit organizations, or the frequency of organ donations (all indicators often deemed to indicate the existence of trust) are in East Germany either close to or even well above (in the case of organ donations) their levels in the West of the country. 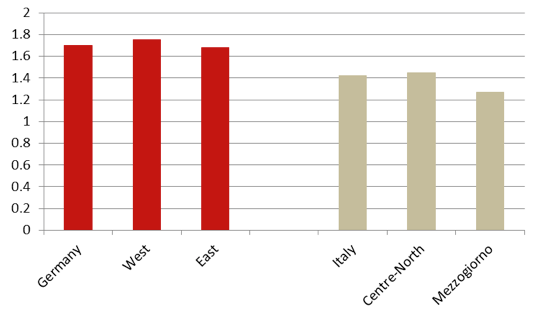 In the Mezzogiorno, by contrast, all these indicators show outcomes well below those of Central-Northern Italy. Comparative research has shown that social capital and economic performance are positively linked and this could well be true for product complexity as well. Complexity usually requires numerous transactions and is thus likely to be helped by the presence of social capital and trust. Interestingly, regressions linking cross country data of export complexity to such governance indicators as the presence of the rule of law or perceptions of corruption show very high degrees of correlation, even when controlling for incomes per capita. Although comparable is not available at the regional level, it is well known that East Germany shares hardly any of the corruption or misgovernment, let alone criminal organisations (like the Mafia, etc.) which are such a blot on the Southern Italian landscape. In other words, East Germany is not like the Mezzogiorno because of labour market flexibility, different evolutions of the tradeable sector, and the weight of history. We argued against the analogy some 20 years ago and developments since then seem to have confirmed that earlier judgement. Germany has seen successful, if still partial, convergence between East and West. Italy has, if anything, seen continuing divergence. Boltho, A., W. Carlin and P. Scaramozzino (1997), “Will East Germany Become a New Mezzogiorno ?”, Journal of Comparative Economics 24(3), 241-64. Buch, C.M. and P. Monti (2010), “Openness and Income Disparities: Does Trade Explain the ‘Mezzogiorno Effect’”, Review of World Economics 145, 667-688. Buch, C.M. and F. Toubal (2009), “Openness and Growth: The Long Shadow of the Berlin Wall”, Journal of Macroeconomics 31(3), 409-23. Guiso, L., P. Sapienza and L. Zingales (2008), “Long Term Persistence”, NBER Working Paper, No. 14278, August. Hausmann, R., J. Hwang and D. Rodrik (2007), “”What you Export Matters”, Journal of Economic Growth 12(1), 1-25. Hausmann, R., C.A. Hidalgo, S. Bustos, M. Coscia, M. A. Yildirim (2013), The Atlas of Economic Complexity: Mapping Paths to Prosperity, Cambridge, MA., MIT Press. Knack, S. and P. Keefer (1997), “Does Social Capital have an Economic Payoff ? A Cross-Country Investigation”, Quarterly Journal of Economics 112(4), 1251-88. SVIMEZ (2011), 150 anni di statistiche italiane: Nord e Sud, 1861-2011, Bologna, Il Mulino.